Growing up in California and working in a Mexican restaurant, I picked up a little bit of Spanish, but I never did learn to speak fluently. I really want to give my children the gift of being able to speak and understand more than just their native language in the hopes that they will have more opportunity (and an easier time learning!) than I did. 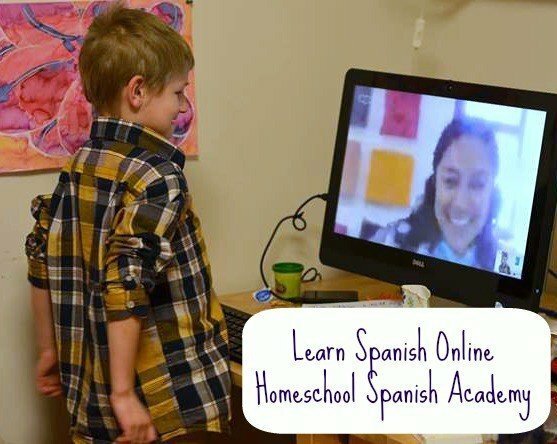 About three months ago, I found Homeschool Spanish Academy, and ever since, teaching Spanish has become much easier, thanks to their online Spanish classes. What is Homeschool Spanish Academy? Homeschool Spanish Academy is a company located in Guatemala. They have dozens of trained, experienced teachers who give one on one Spanish lessons via Skype to learners of all ages. They have their own curriculum which you can move through at your own pace, as quickly or as slowly as you need. Even though the teachers are fluent Spanish speakers, the website is in English, and the teachers also are fluent in English as well as Spanish, so you don’t need to worry about any confusion while scheduling lessons or dealing with billing. 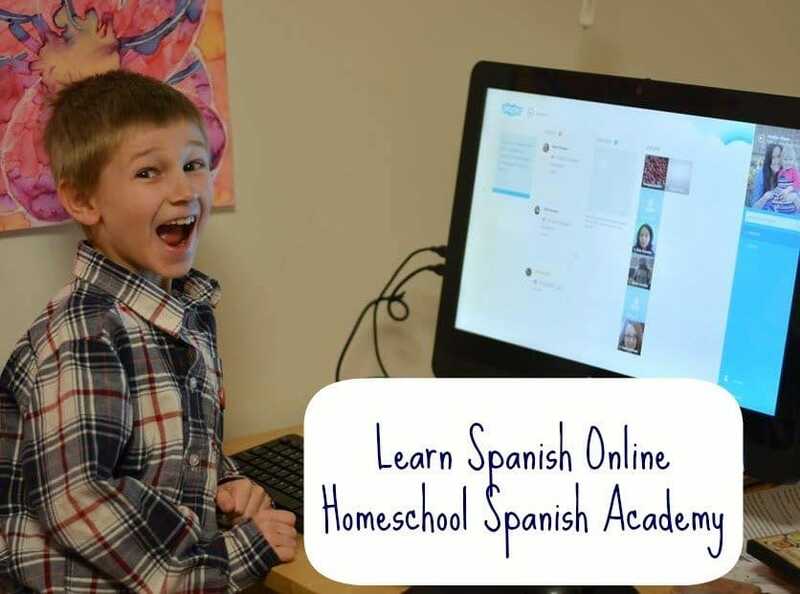 When you sign up for Homeschool Spanish Academy, you purchase a set number of classes. I started with 15 classes, once a week for Bug, which covers a full semester of Spanish class. After you purchase your lessons, you have a chance to schedule them online with one of the teachers. You can do this one of two ways- either choose a specific teacher, and then choose when you have a lesson based on their availability, or choose a time of the day, and just take any teacher available. Homeschool Spanish Academy keeps clear records, so even if you switch teachers during your lessons, you won’t miss a beat. After each lesson, you will be emailed homework, or review PDF assignments to work on, and submit if your teacher requests. They even will test you, and issue grades, so older students can use Homeschool Spanish Academy for high school credit. Kids as young as 6 can start, and even fluent speakers can benefit from Homeschool Spanish Academy. There is no “aging out” of the program because the teachers are fluent, native speakers, and can continue to provide new challenges even to fluent speakers. I’ve just loved Homeschool Spanish Academy. Bug has been taking lessons for about 11 weeks now, and I can see huge improvements in his confidence and comprehension. I chose to have him have class with the same teacher each week, so the time we “attend” changes a little from week to week depending on her availability, but I was able to schedule the lessons 2-3 months out at a time, and I have them all programmed into my calendar. His teacher is an absolute joy. She knows just how to talk to children, and brought him out of his shell from the first lesson. She is personable and remembers him from week to week. We missed two lessons from small emergencies that came up, and sent us an email to make sure he was alright and wished him well. When we missed the class she even tried to call my cell early in the half hour to make sure I didn’t just forget. I love that she really seems to care about him, and his lessons, and love that she follows up with us. The lessons themselves are really impressive. Homeschool Spanish Academy has a pre-planned curriculum, so they are following a plan, rather than just “winging” the lessons. It’s well organized, so not a moment is wasted. The teacher is always on time, and we get the Skype call exactly when we are supposed to. I also really appreciate the PDF assignments that are sent to me. I am able to print them off, and know exactly what Bug should be working on that week to be ready for the next lesson. I highly recommend this program and think you should head over there now to get signed up for a free lesson. You don’t have to take my word for how awesome it is, this program will speak for itself! I will recommend this to my friend, because she needs another online tutorial after she enrolled in a skype online spanish tutorial. She told me she wants to know more but kinda try another. But she is good in speaking the language already, maybe she needs to compare. Who’s the best teacher I will recommend? I am highly considering using the program for my 6 year old son! Would you mind telling me the name of the teacher you used and loved? Learning another language alone allows for a whole new world to open up. Not only does it allow you to speak with a good portion of the world’s population, making yourself more marketable in the career force, but it wires the brain in a way that only learning languages can. I want to improve my Spanish speaking skills, in turn, being a model for my children who I hope will have a love for learning languages as well! I’ve been looking at this program for a while and I’d love to win for my son! We have so many Spanish speaking people around, and we’d love to be able to interact with them better at the Food Pantry especially. My 12 year old daughter absolutely LOVES this. Her teacher is excellent with her and she has learned soooo much!!! Spanish is just something I would love to teach my kids…My Dad is better at it than me but I just haven’t found the right program yet! We really loved HSA when we tried it last year. I am hoping to sign my daughter up again, so she can continue her lessons. I want to teach Spanish, because I am fascinated with the language . . . so is my daughter. I also want her to learn Spanish, because the language is prominent in San Antonio and other areas near our location. I want my daughter to have the opportunity to communicate with those around her and don’t want language to be a barrier. I want her to understand and be aware of the language and cultural differences. With regards to her future, being bilingual gives her more options in the job market. Thank you for the opportunity to win this awesome program – I have heard a lot about it. I think Alyssa would also benefit from learning from another adult while having age-appropriate lessons. I would love for my boys to have the opportunity to try this program! It sounds fantastic. We haven’t gained much traction using the various iPad/Pod apps and I know a live face across the screen would be a great help. This sounds like an excellent program. Thanks for sharing. This sounds like an awesome program! Is there a counterpart for other languages as well? There is not, since it’s local to Guatemala. I wish they had sister companies around the globe! Where we live, I have seen that speaking fluent Spanish would be so very useful for my kids! I wish I knew Spanish myself. My son needs a year of foreign language to graduate, but more importantly, he wants to go into the medical field and Spanish would be a huge asset. I’d love to win this for the boys. I’d love to win this for the boys!